HE WROTE....: Tibet is the most convenient country of all for flying saucers. It is remote from the bustle of the everyday world, and is peopled by those who place religion and scientific concepts before material gain. 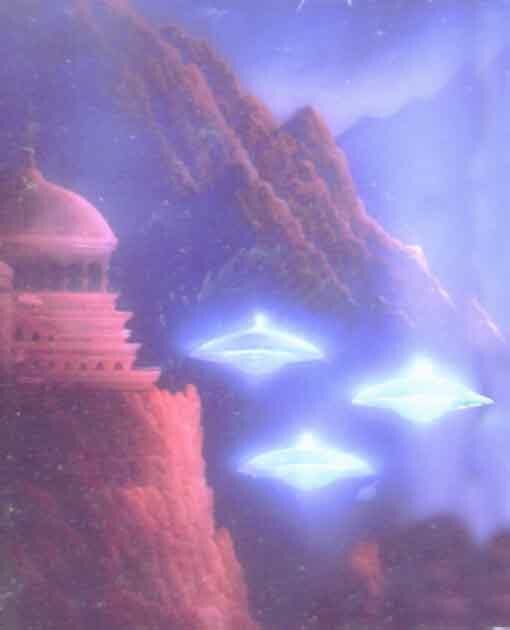 Throughout the centuries the people of Tibet have known the truth about flying saucers, what they are, why they are, how they work, and the purpose behind it all. We know of the flying saucer people as the gods in the sky in their fiery chariots. But let me relate an incident which certainly has never been told before in any country outside of Tibet, and which is utterly true. "....The day was bitter. Frozen pellets of ice driven by the howling gale(storm), hammered like bullets into our flapping robes and tore the skin off any exposed surface. The sky was a vivid purple with patches of startlitling (fylte) white cloud which raced off into the hinterland. Here - nearly thirty thousand feet above the sea, in the Chang Tang Highlands of Tibet, we were toiling upwards, upward. At our last resting place - some five miles behind us - a voice had come into our consciousness: "Strive on, my brothers. Strive on, and enter the fog belt again, for there is much for you to see." The seven of us, all high lamas from the lama-series of Tibet, had had much telepathic communication with the Gods of the Skies. From them we had learned the secret of the chariots, which sped swiftly across our land and which sometimes alighted in remote districts. Onwards we climbed, higher, and higher, clawing a foot-hold in the hard earth, forcing our fingers into the slightest crevice (sprekk) in the rocks. At last we reached the mysterious fog belt again, and entered. Soon we were through it and into the wonderfully heated land of a bygone age. "A days march more, my brothers," he said "and you shall see a chariot of old." For that night we rested in the warmth and comfort of the Hidden Land. We found ease and relaxation on a soft bed of moss, and in the morning we gratefully bathed in a warm, broad river before setting out on another days march. Here in this land there were pleasant fruits which we took with us for our meal, a satisfactory change indeed from the eternal tsampa. Throughout that day we journeyed upwards through pleasant trees of rhododendron and walnut, and other the like of which we had not seen before. All the time we were rising upwards, and all the time we were in this pleasant warm land. With nightfall upon us we made our camp beneath some trees, and lit our fire, then rolled ourselves in our robes, and fell asleep. With the first light of dawn we were again ready to continue our journey. For perhaps another two to two and a half miles we marched, and then came to an open clearing. Here we were stopped, dumbfounded (stumme av forbløffelse) with amazement; the clearing before us was vast, and incredible. The open plain we saw was perhaps five miles across, and the scene was so strange that even now I hesitate (nøle) to write because of the knowledge that I shall be disbelieved. The plain was about five miles across and at its distant side there was a vast sheet of ice extending upwards, like a sheet of glass reaching toward the heavens. But that was not the strangest thing before us, for the plain contained a ruined city, and yet some buildings were quite intact. Some buildings, in fact, looked almost new. Nearby, in a spacious courtyard, there was an immense metal structure which reminded me of two of our temple dishes clamped together and it was clearly a vehicle of some sort. My guide, the Lama Mingyar Dondup, broke our awed silence, saying. "This was the home of the Gods half a million years ago. During those days men strove against the Gods, and invented a device to shatter an atom, which wrought disaster on the earth, causing lands to rise and lands to sink, destroying mountains and creating anew. This was a mighty city, the metropolis, and here was once the sea-shore. The convulsion (krampetrekninger) of the earth, which followed, and the explosion - raised this land thousands of feet, and the shock of that explosion altered the rotation of the earth. We shall go closer, and we shall see other parts of the city embedded in the ice of the glacier- -a glacier which, in this hot valley, has gently melted - leaving intact these ancient buildings." We approached the strange vehicle of metal. It was immense. Perhaps fifty or sixty feet across, and now dulled with age. We saw a ladder extending up into a dark opening and, feeling as if we trod sacred ground, we crept up, one by one. The Lama Mingyar Dondup went first and soon disappeared into the dark hole. I was next, and as I reached the top of the ladder and stepped inside the metal hull I saw my guide bending over what looked to be a sloping table in this large metal room. He touched some-thing, and a bluish light came, and there was a faint hum(summing). To our horrified amazement, at the far end of the room figures appeared and walked toward us and spoke to us. Tibetan sacred texts speak of a mystical kingdom called Shambhala, hidden behind snow peaks somewhere north of Tibet, where the most sacred Buddhist teachings -- the Kalachakra or Wheel of Time -- are preserved. It is prophesied that a future king of Shambhala will come with a great army to free the world from barbarism and tyranny, and will usher in a golden age. Similarly, the Hindu Puranas say that a future world redeemer -- the kalki-avatara, the tenth and final manifestation of Vishnu -- will come from Shambhala. Both the Hindu and Buddhist traditions say it contains a magnificent central palace radiating a powerful, diamondlike light. It has been called the Forbidden Land, the Land of White Waters . 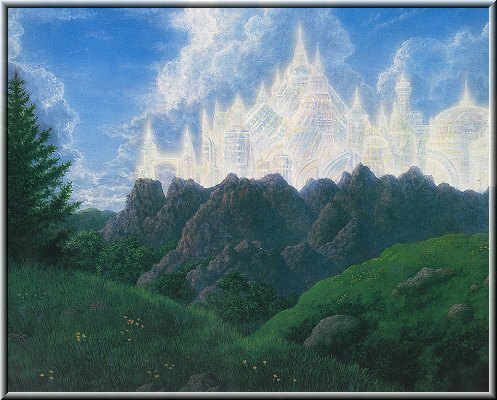 . . , the Land of Radiant Spirits, the Land of Living Fire, the Land of the Living Gods and the Land of Wonders. Hindus have known it as Aryavarsha, the land from which the Vedas come; the Chinese as Hsi Tien, the Western Paradise of Hsi Wang Mu, the Royal Mother of the West; the Russian Old Believers, a nineteenth-century Christian sect, knew it as Belovodye and the Kirghiz people as Janaidar. But throughout Asia it is best known by its Sanskrit name, Shambhala, meaning 'the place of peace, of tranquillity,' or as Chang Shambhala(may be from its lying in the Chang Tang mountains? Rø-), northern Shambhala, the name Hindus use to distinguish it from an Indian town of the same name. . . . [A]t the end of his life the Chinese Taoist teacher Lao-Tzu, returned to Shambhala, although he called it Tebu Land. . . .
Buddhist texts say that Shambhala can be reached only by a long and difficult journey across a wilderness of deserts and mountains, and warn that only those who are called and have the necessary spiritual preparation will be able to find it; others will find only blinding storms, empty mountains, or even death. One text says that the kingdom of Shambhala is round, but it is usually depicted as an eight-petalled lotus blossom -- a symbol of the heart chakra. Indeed, an old Tibetan story states that 'The kingdom of Shambhala is in your own heart.' As Edwin Bernbaum points out, the guidebooks to Shambhala, whose puzzling directions are a mixture of realism and fantasy, can be read, on one level, as 'instructions for taking an inner journey from the familiar world of the surface consciousness through the wilds of the subconscious to the hidden sanctuary of the superconscious' . Nevertheless, the idea that Shambhala is also located in the material world is firmly rooted in Tibetan tradition. Opinions on where the kingdom might lie, however, differ markedly. Some Tibetans think it might be in Tibet, perhaps in the Kunlun mountains; more point toward the region around Mongolia and Sinkiang province of China; but most believe that Shambhala is in Siberia or some other part of Russia. Some lamas believe it is hidden in the desolate, uninhabited wastes of the Arctic. According to Lama Kunga Rimpoche, 'Shambhala is probably at the North Pole, since the North Pole is surrounded by ice, and Shambhala is surrounded by ice mountains.' Finally, a few lamas believe that Shambhala exists outside the earth on another planet or in another 'dimension' . Bernbaum once had a dream of going with a guide to the north pole. As they approached the pole, the air became warmer and the snow cover thinner until there was only grassy tundra, flowers, and a balmy breeze. Finally they came to a round pond with a small island that had a pole right at the centre. He turned to his guide and protested, 'But this is impossible! This can't be the north pole; there's supposed to be ice and snow up here.' The guide merely pointed at the island and said with a smile, 'There's the pole.' Bernbaum related his dream to Lama Chopgye Trichen Rimpoche, who remarked: 'That may have been the entrance to Shambhala' . The Russian artist, philosopher, and explorer Nicholas Roerich (1874-1947) travelled through China and Mongolia to the borders of Tibet in 1925-1928. During a conversation with a lama, he was told: 'Great Shambhala is far beyond the ocean. It is the mighty heavenly domain. It has nothing to do with our Earth. . . . Only in some places, in the Far North, can you discern the resplendent rays of Shambhala.' When pressed by Roerich, the lama conceded that the heavenly Shambhala had an earthly counterpart. Indeed, the expression 'the resplendent rays of Shambhala' seems to be a reference to the aurora that manifests in the polar region. But the lama also described Shambhala as a 'far-off valley', hidden in the midst of high mountains, with hot springs and rich vegetation. The lama stated that the ruler of Shambhala is 'ever vigilant in the cause of mankind': he sees all the events of earth in his 'magic mirror' and 'the might of his thought penetrates into far-off lands'. He continued: 'Uncountable are the inhabitants of Shambhala. Numerous are the splendid new forces and achievements which are being prepared there for humanity.' The lama confirmed that messengers from Shambhala are at work in the world, and that even the ruler himself sometimes appears in human form. He stressed that the secrets of Shambhala are well guarded, and that it is impossible for anybody to reach Shambhala unless their karma is ready and they are called . Shambhala . . . , although no erudite Orientalist has yet succeeded in locating it geographically, is an actual land or district, the seat of the greatest brotherhood of spiritual adepts and their chiefs on earth today. From Shambhala at certain times in the history of the world, or more accurately of our own fifth root-race, come forth the messengers or envoys for spiritual and intellectual work among men. Shambhala, our 'spiritual home', is said in theosophy to comprise two localities on earth. One of them is 'situated in the highlands of Asia, somewhere to the westward of the meridian line passing through Lhassa' . Long ago, this locality was a sacred island in a vast Central Asian inland sea, known as the 'abyss of learning' or 'sea of knowledge', and was accessible via subterranean passages. According to tradition, this place exists to this day as an oasis surrounded by the Gobi desert . In other words, Shambhala, in one of its meanings, is the Sacred Imperishable Land. 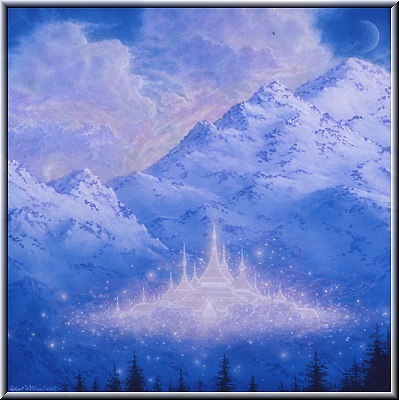 Theosophical literature also states that there is an even higher Shambhala located in the sun, and that all these different localities are inhabited by classes of entities with which the human race is spiritually and intellectually connected. Bearing in mind that the Central Asian Shambhala is said to be protected by an 'akashic veil' which renders it invisible and impenetrable, it is interesting to note that in the review of The Hollow Earth, Blavatsky suggests that explorers may have been prevented from penetrating further north into what was then suspected to be an open polar sea by 'the exercise of some occult power'. This could be interpreted to mean that there is something in the northern polar region that is being concealed -- not by a military/government conspiracy, but by occult forces. 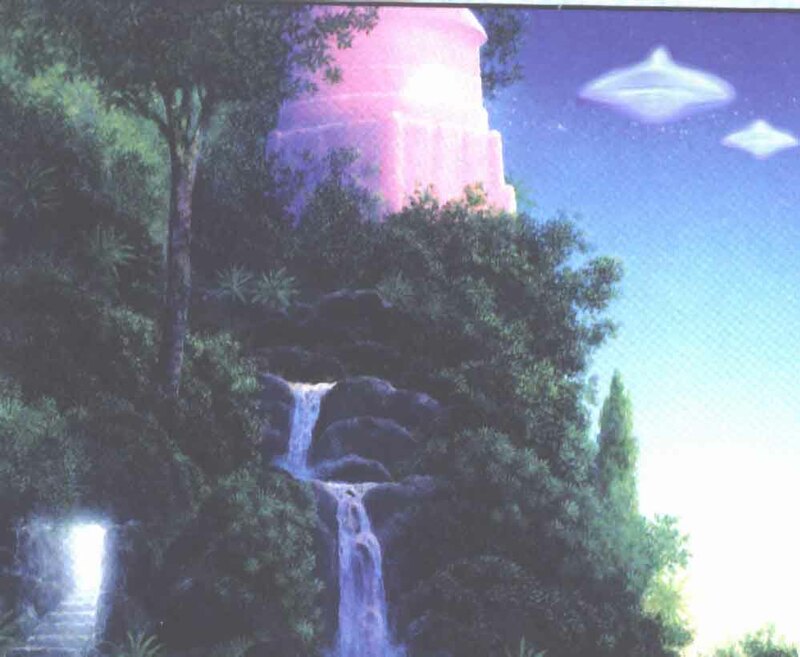 Victoria LePage, Shambhala: The fascinating truth behind the myth of Shangri-La, Wheaton, IL: Quest, 1996, pp. 6-8. Edwin Bernbaum, The way to shambhala, Los Angeles, CA: Jeremy P. Tarcher, 1980, p. 207. Nicholas Roerich, Shambhala: In search of the new era, Rochester, VE: Inner Traditions, 1990, pp. 1-33. G. de Purucker, Occult glossary, 2nd ed., Pasadena, CA: Theosophical University Press, 1996, pp. 155-6. Dialogues of G. de Purucker, Pasadena, CA: Theosophical University Press, 1948, 1:146-7. G. de Purucker, Esoteric teachings, San Diego, CA: Point Loma Publications, 1987, 2:9. H.P. Blavatsky, Isis unveiled (1877), Pasadena, CA: Theosophical University Press, 1972, 1:589-90; H.P. Blavatsky, The secret doctrine (1888), Pasadena, CA: Theosophical University Press, 1977, 2:220, 319, 502-3, 636-7; A.T. Barker (comp. ), The mahatma letters to A.P. Sinnett, 2nd ed., Pasadena, CA: Theosophical University Press, 1975, p. 155. G. de Purucker, Fountain-source of occultism, Pasadena, CA: Theosophical University Press, 1974, p. 530.